AUTISM ACTION PLAN : ONE YEAR LATER : NOTHING IN IT FOR ME! In order to commemorate the anniversary of the Autism Action Plan, we are requesting of you to send a message describing your current situation one year after its announcement, to the Ministers/MNAs and journalists listed below. The purpose of this collective campaign is to draw the media’s attention. Therefore, we need you to send your messages on Monday March 19th 2018. (Should you miss the date, please send it in the days that follow). In the message to be sent to the Ministers/MNAs, please send a brief description of your current situation along with a picture of your child (whether a child or adult). «AUTISM ACTION PLAN : ONE YEAR LATER : NOTHING IN IT FOR ME! Provide a description of your current situation whether in relation to cuts to services or subsidies, endless waiting lists, refusals of services or subsidies, etc. – I have been paying for rehabilitation services in the private sector, because my child is still on a waiting list for several years. -My family has been waiting for residential services for the last 7 years. -My “Soutien aux Familles” funding is grossly underfunded to meet my family’s needs. -My child developed behavior problems since his day program hours were cut. « AUTISM ACTION PLAN : ONE YEAR LATER : NOTHING IN IT FOR ME! We are families of people with autism and are counting on your support to denounce the lack of services for autism in Quebec. This message was also sent to Ministers: Couillard, Barrette, Charlebois and Leitao, as well as the MNAs Dave Turcotte, Amir Khadir and François Paradis. 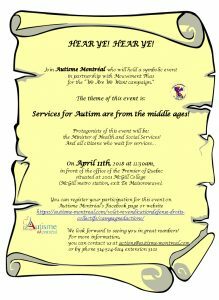 The the me of this event is: Services for Autism are from the middle ages! On April 11th, 2018 at 11:30am, in front of the office of the Premier of Quebec situated at 2001 McGill College (McGill metro station, exit De Maisonneuve). Make complaints with a certified copy to Autisme Montréal: either because you are waiting to obtain services, you do not have the necessary funds to pay for the respite you need, you are being denied services, etc., it is important to denounce these situations. click here for more information. Take part in the mobilization action of Autisme Montréal, which will take place on April 11 in front of the Prime Minister’s offices in Montreal, to denounce the lack of services, waiting lists, etc. Please mark this date in your diary! Under the theme: Autism services date back to the Middle Ages! Do your portrait. We will share them throughout the month of April, to raise awareness amongst our elected representatives regarding the various needs of autistic individuals. Sign the petition against the cuts at the Miriam Home and Services for individuals aged 21 and more.You have until February 5, 2018 to sign it! Sign the petition regarding the funding of community organizations and the recognition of their autonomy. You have until February 4, 2018 to sign it! You may also sign the hard copy in the offices of Autisme Montréal. Several community organizations will organize mobilization activities as part of their collaboration with the Mouvement PHAS to ask for the access and maintenance of the services provided by the health and social services network. The launching of the mobilization campaign for the access to services will take place on March 19, 2018 and it will run from March to June. Several community organizations will organize mobilization activities and you are invited to take part according to your availability. 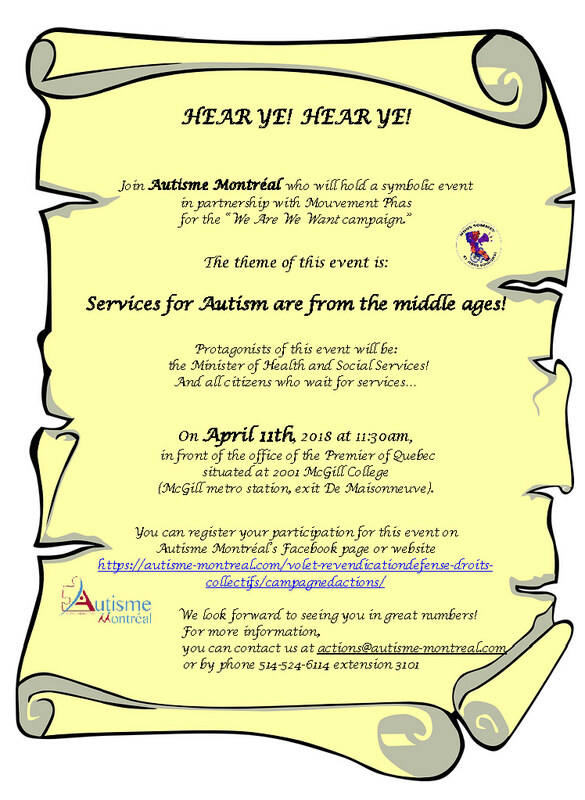 The mobilization activity organized by Autisme Montréal on April 11 will be under the theme: Autism services date back to the Middle Ages! For more information, please visit regularly the Facebook page of Autisme Montréal or write to us at actions@autisme-montreal.com. As part of our collaboration with the CRADI, we invite you to complete an information sheet. These sheets will allow us to demonstrate to the MNAs of each concerned electoral division how difficult it is to have access to social and health services for families and individuals. The more information sheets we have, the more impact we will have. There are 2 different ways of doing so. This sheet must be completed by hand. Print the photo and glue it on the top left of the sheet. The sheet may be completed directly on the Internet site. Do not forget to print the sheet when you are done. Add the photo to the printed copy. P.S. : It is not mandatory to have a recognizable photo of the person. The goal is to demonstrate that they are “real” people. A family may decide to add a family photo rather than a photo of the person. You may send your information sheet to Autisme Montréal or directly to the CRADI, no later than February 1, 2018. Note: The meetings with the MNAs will take place between February 15 and March 30. For more explanations or information, please contact the CRADI at the following address: communications@cradi.com.